In the spirit of the avid desert botanist Willis Linn Jepson, The Jepson Desert Manual provides botanical enthusiasts of all backgrounds with the first comprehensive field guide focused exclusively on native and naturalized vascular plants of California's southeastern deserts. 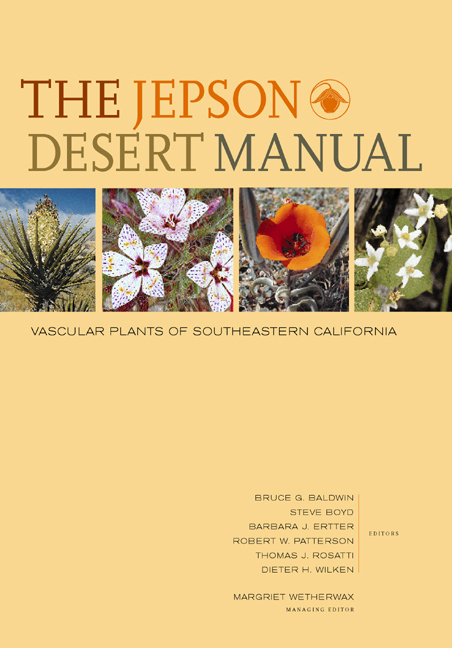 Based on The Jepson Manual: Higher Plants of California, the Desert Manual incorporates new illustrations for more than two hundred desert taxa, revised keys to identification, updated distributional information, and 128 color photographs. This guide will allow easier identification of California's fascinating desert plants than would be possible in a manual with broader geographic coverage. As in The Jepson Manual, detailed descriptions and illustrations of plant characteristics are provided, along with information on native versus alien status, habitats, elevation, endangerment, toxicity, weed status, horticultural requirements, and flowering times. Introductory sections on the desert setting and vegetation offer the reader a broad context and new perspectives for appreciating the more than twenty five hundred plant species included in the Manual. For amateur and professional botanists alike, the Desert Manual will prove to be an invaluable companion in California's spectacular Mojave Desert, Sonoran Desert, and southern Great Basin environments, including the White Mountains.